Yesterday evening at 5:53 p.m., a M=4.1 earthquake struck just east of San Jose, California. This minor earthquake generated light shaking throughout much of the South Bay, Peninsula, and East Bay, with some people reporting feeling the quake in San Francisco. Because shaking was not severe, not damage was sustained, though over 5,000 people filled out felt reports on the USGS website. However, given the scope of the shaking, over 2 million people were exposed to some level of shaking. This Temblor map shows the location of yesterday’s M=4.1 earthquake east of San Jose, as well as the three major faults around the Bay Area. Also labeled on this map is the location of Anderson Dam, which sits within a couple kilometers of the fault. If a large magnitude earthquake were to occur along the Calaveras, the dam could fail, which could flood San Jose. From the USGS focal mechanism, we know that this earthquake was pure right-lateral strike-slip in nature. Given this, and the quake’s location, it struck along the Calaveras Fault, which extends from just south of Walnut Creek, to south of Hollister where it joins up with the San Andreas. Historically, the Calaveras Fault has produced much larger magnitude earthquakes, including in 1984, when a M=6.2 earthquake struck near Morgan Hill, resulting in over $7.5 million in damage. A major reason why activity along the Calaveras Fault deserves close attention is because the USGS gives it has the second highest probability of rupturing in a large magnitude (M≥6.7) by 2043. The probability given, 26%, is only behind the nearby Hayward Fault, which has a 33% chance of rupturing. The Hayward Fault also comes into play because in 2015, UC Berkeley seismologists showed that the Hayward Fault is a branch of the Calaveras, which means both faults could rupture simultaneously in large magnitude quakes. While a large magnitude Calaveras Fault earthquake would generate significant shaking and residential damage throughout much of the Bay Area, there is also a large piece of infrastructure at risk. Anderson Dam, a dam which has been identified as being seismically at risk, sits right next to the Calaveras. While a plan to seismically retrofit the dam officially began in 2012, the earliest construction would start is 2020. If a large earthquake were to cause the dam to fail, the resulting flooding could inundate much of San Jose. Therefore, highlighting an earthquake, even a small one like yesterday’s M=4.1, is important because of the risk the Calaveras Fault poses to several million people. I don’t understand % containment. If the fire remained at 27k Acres burned, how is it 0% contained? Where is the concept of fire containment explained? Doesn’t the Rogers Creek fault connect to the Hayward under San Pablo Bay? Could all three rupture in one event? If so, the Bay Area might be toast. Thank you for the link. It was very informative. Two more questions if I may. 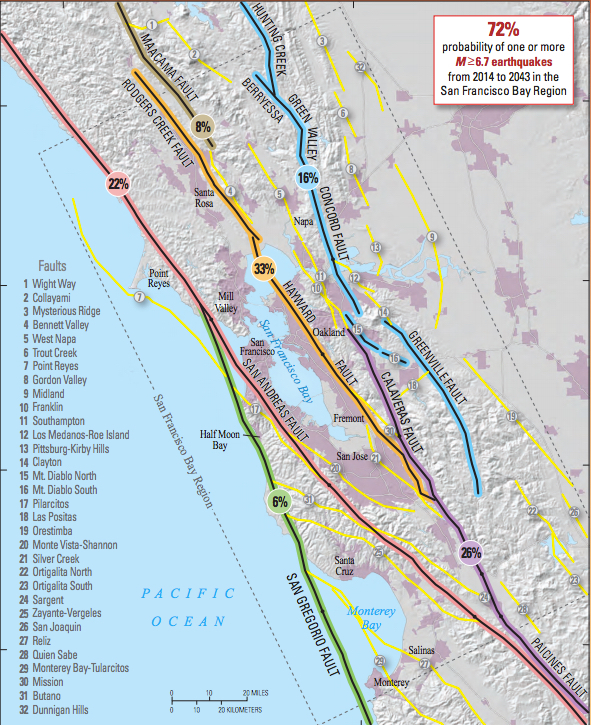 First, am I correct in understanding that the Rogers Creek, Hayward and Calaveras faults actually are one continuous fault stretching from the North Bay to Hollister? Second, if that is the case does that mean the maximum credible event has increased due to the 120 mile length of this fault system? Thank you very much for the fast reply and for the informative app.